Raised in the northern village of Barrow, AK I developed a diverse passion for the outdoors and a love for “Alaskan” life. With the help of my folks I spent an abundant amount of time on rivers throughout Alaska, as well as hearing bedtime stories of “Nagol the Adventurer” – funny how things come to fruition. The opportunity to grow up in a remote village shaped my appreciation for personal challenge, and the connection found in small, tight-knit communities. addition, I started to explore the professional guiding industry. For the last five years I have been developing as a professional guide and outdoor educator. 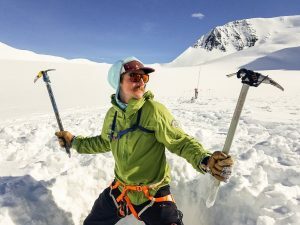 Collectively, running expeditions on mountains and rivers throughout South-Central Alaska, Arizona, Colorado, and Utah, as well as teaching skiing and ice climbing to people with disabilities. I on-boarded with Mountain Trip in 2017 and have completed three West Buttress expeditions. I’ve thoroughly enjoyed being able to share the place I call home with guests from all over the world and love hearing their stories, where I’m reminded to slow down, listen, and show gratitude. Nowadays, I spend the winter backcountry ski guiding in Cooke City, MT, the spring/early summer mountain guiding on Denali, the rest of the summer whitewater guiding in Alaska, and the fall whitewater guiding in the Grand Canyon. Here’s to high fives and happiness!